Big Food feels our love for pumpkin pie; Trader Joe’s is stocking more than 35 products with those flavors this season. Here’s the real thing in the form of French toast. The soaking custard for the pumpkin French toast, made with canned pumpkin, is rather thick. Give the bread enough time to absorb the mixture. 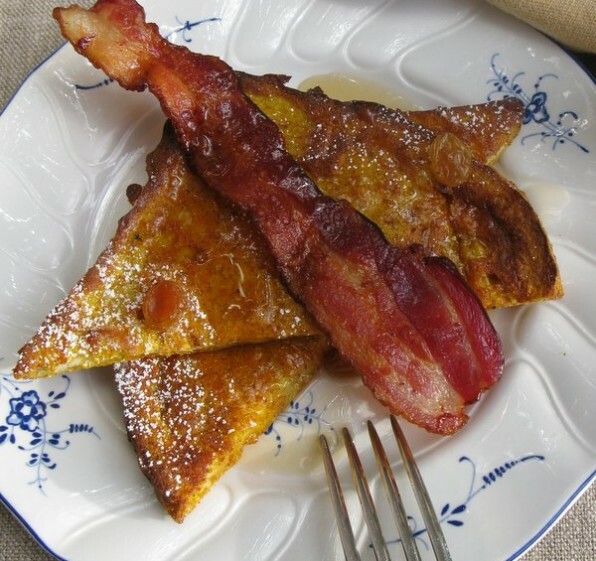 I prefer to pan fry French toast but it can be baked instead. Either way, serve it with maple syrup and smoky bacon. I developed this recipe to share with the reader’s of The E List, Erica Tannen’s “Excruciatingly Opinionated Guide to the Connecticut Shoreline.” It’s a weekly electronic newsletter of all that is fun, delicious, healthful and interesting in our area. Everyone that lives here reads it. You should too. Whisk the light cream and sugar into the pumpkin purée. Add the spices and salt then whisk in the eggs until the mixture is smooth. Heat a large skillet or griddle over medium high heat. Melt a couple of tablespoons of the butter in the pan. When it stops sizzling, put two or more slices of the soaked bread in the pan. Cook until evenly browned, approximately 4 to 5 minutes then flip and cook on the other side. Dust the slices with powdered sugar then serve immediately or keep the French toast warm in a 250°F oven. Scatter the French toast with golden raisins. Oven Baked Version: Preheat the oven to 400°F. Generously grease a baking sheet with the butter. Drain each slice of soaked bread then place them on the prepared pan. Bake the bread for 10 minutes. Flip over each slice then bake for another 5 to 8 minutes until the French toast slices are nicely browned.